With football season starting back up strong, tailgating games are back in fashion. Some of the more popular games including Corn Hole and Ladder Ball offer a simple setup and team competition, but often lack a touch of strategy that makes another game great. 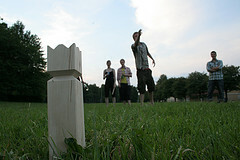 A Swedish game called Kubb is set to spread like wildfire among the lawn game crowd. Kubb is an easy to learn, yet challenging yard game for people of all ages. Anywhere from two to twelve players can play at once making it great for any occasion. The game is based on a simple concept of knocking over blocks with batons, but provides much excitement as the game develops to the eventual take down of the king block. In general, this is how Kubb is played. Each team sets up 5 blocks on a goal line and a king block is placed in the middle of the field – let’s call it the 50-yd line. Teams alternate tossing 6 batons at the opposing blocks with the objective being to knock over all blocks on the opposing goal line and then the king block (think 8-ball). If the king block is knocked over in any way before the right time, that team loses. The extra element of the game is that after each baton toss, the opposing team picks up any knocked over blocks and must toss them from their line of scrimmage to the other half of the field and attack these blocks before going after the opposing goal line. Always toss batons and knocked over blocks from the standing block closest to the 50-yd line. Usually this is just your goal line but if the other team messes up, this could be further up field. If you’re a little confused check out the official World Championship Kubb Rule Book. I have yet to find a person who has tried Kubb and not loved it, so find a way to try today. The great thing about Kubb is that you can make it yourself in 15 minutes. Based on the advice of a good friend, I recommend going up to your local home improvement store (e.g. Home Depot) to purchase the following. Most stores will provide the cuts for free or at a low cost. An 8 foot 4×4 fence post with some type of styled top. Cut 10 blocks that are 8in in length starting at the bottom. This will leave you with a 16in piece with the styled top which can be the king block. 2 round dowels (wooden poles) each a yard in length. Cut the 2 dowels into 1 foot batons so that you have 6 batons. I recommend using 1.25in diameter oak wood dowels to keep these as heavy as possible so they can knock over the blocks. You can also consider purchasing 4 stakes to mark the boundaries of your field. Altogether, this should cost $20-25. Alternatively, you can purchase Kubb online for $60-80. 10 – With room for 12, this game allows any group to enjoy a nice day outside. 8 – Although the game can get unreasonably expensive when buying online, ten minutes in a home improvement store makes the cost of this game a great deal. 9 – It’s one of those games you have to see to believe so most people are skeptical before trying. Everyone ends up loving the game, so I won’t be surprised to see this on ESPN2 before long. 7 – Throwing sticks may not be the most physically challenging sport but at least it gets you outside. For more great lawn games, check out the Wikipedia Lawn Games page. Outsourcing unnecessary tasks in your life is one strategy I believe will free you up to what you are designed to do best. With that said, it can be hard to justify paying someone to do a task you could do pretty easily. I’d like to present an idea on why paying for outsourced tasks is worthwhile. Opportunity cost is a concept that generally urges someone to consider what opportunity they are giving up when doing something new. If the lost opportunity (a cost) is greater than the new opportunity (a gain), then the status quo should remain intact. When evaluating what you are willing to pay for an outsourced task, you shouldn’t think about the difficulty of the task. Instead, you should consider what opportunity you are giving up when you do that task. If you can be investing in skills or a hobby that could benefit you by adding a hundred dollars to your salary or giving you new income, then it may make sense to pay someone $10-$20 per hour of time saved. Even if that task is mowing your lawn and you are willing to do it yourself, the incremental value of that hour may justify finding someone else to cut the grass. When I discuss outsourcing, I’m not referring to shipping all your duties overseas (though that is a possibility). Most of the time these tasks can and will require you to invest in your local community. There are some tasks, though, that may best be served by someone around the world. Either way, you are creating jobs for others while improving your ability to contribute to and benefit from others. Here are some simple examples tasks that anyone can outsource. Consider which ones may best help you and come up with your own that best fit your situation. Home Cleaning – it may seem like something you’re supposed to do, but if that time is worth more to you then consider giving it up. Lawn Care – people who live in apartments already outsource this. Consider giving it up if you don’t love getting outside every week to keep things green. Personal Secretary – it’s not just for corporate managers anymore. Some people have found it worthwhile to outsource time consuming tasks like email to personal agents in India. Check out the 4-Hour Work Week blog for more crazy ideas. Finally, don’t just weigh the amount of time a task takes you. There are always those tasks that provide us with a break from everything else in life or a chance to do something just for fun without worrying about money. Until you find the career that provides you with this enjoyment, don’t give these hobbies up. Next week I’ll lay out some ways to use your free time as an investment in your future. For now, I’m considering giving up home cleaning or lawn care to have more time to invest in my skills and revenue generating hobbies. What could you consider giving up? Why and How to Buy Time is featured in the Festival of Frugality at My Personal Finance Journey.